Karen Sueda, DVM, DACVB, is a veterinary behaviorist at VCA West Los Angeles Animal Hospital. She earned her DVM from University of California, Davis, where she also completed a clinical animal behavior residency. She completed an internship at Veterinary Medical and Surgical Group in Ventura, California, and has served as president of the executive board of the American Veterinary Society of Animal Behavior. Dr. Sueda’s special interests include feline behavior, canine anxiety disorders, and the human–animal bond. Julie Cho, DVM, a small animal veterinarian practicing in Los Angeles, California, is currently completing a 1-year small animal rotating internship at VCA West Los Angeles Animal Hospital, after which she plans to pursue a residency in veterinary behavior. Her areas of interest include canine anxiety disorders and the human–animal bond. Dr. Cho earned her DVM from University of Minnesota. 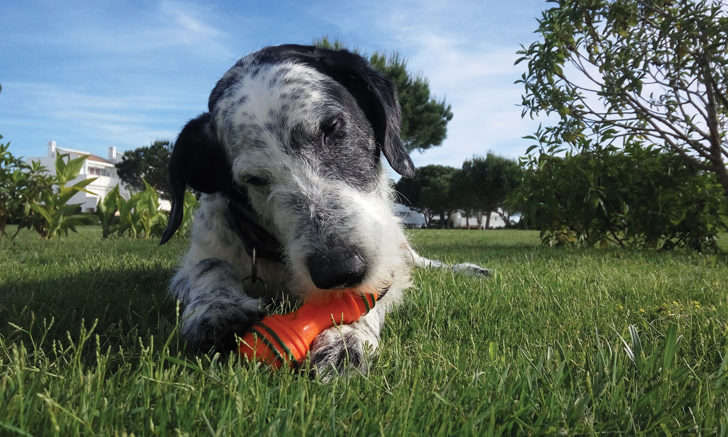 Offering enrichment for geriatric or senior dogs and cats can slow age-related cognitive decline and strengthen the human–animal bond. Enrichment strategies can be tailored to the individual patient to enhance different modalities (eg, physical, sensory, mental, social). Why Enrich an Aging Brain? 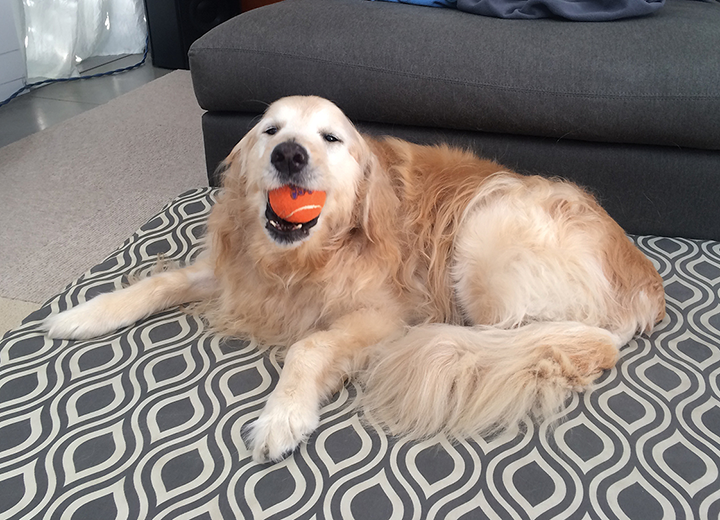 Cognitive care and environmental enrichment may reduce age-related changes in the brain.6 Owners can increase mental stimulation in their senior pet through physical activity, environmental enrichment, and social interaction. It is important to assess all aspects of a patient (eg, history, physical state, sensory capabilities, mental state) when making enrichment recommendations. Older patients may have concurrent medical or behavior issues that must be accommodated, so it is important to assess all attributes of each patient. Many older animals suffer from osteoarthritis or neurologic conditions that limit physical activity. For such patients, enrichment activities should be tailored to minimize pain, discomfort, and injury risk (Figure 1). For example, providing nonslip surfaces (eg, rugs, mats) may provide more secure footing and encourage pets to be more active. A series of steps or platforms may allow elderly cats access to preferred, elevated resting areas they can no longer reach by jumping (Figure 2). For pets with exercise intolerance or decreased stamina, focus should be on mental or sensory stimulation rather than physical activity. 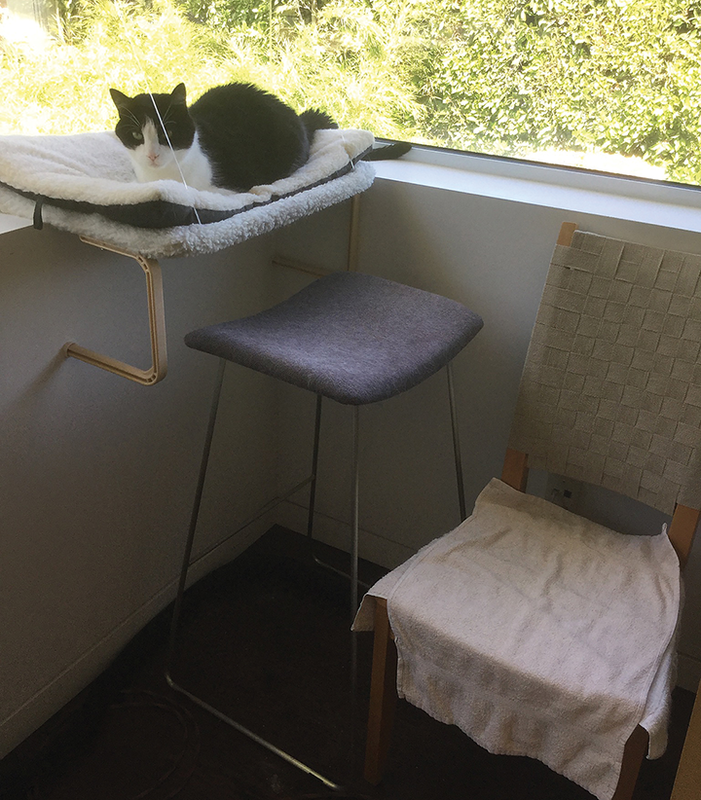 Figure 2 Chairs of various heights were added to allow this 15-year-old cat continued access to a favorite window perch. Eyesight, hearing, and olfaction may be reduced in elderly pets. For these patients, training may be modified by using visual (ie, hand) signals or by using verbal or tactile cues (eg, light tap on shoulder). Abrupt changes to environment or routine may stress older pets, particularly cats. Enrichment plans should be introduced slowly or limited to one or 2 minor changes at a time. Once a pet is accustomed to these modifications, additional activities may be added. Acute and chronic exercise have both been shown to improve memory in elderly beagles.7 Exercise recommendations should take each pet’s physical abilities and health status into consideration. Slow, controlled leash walks, swimming, or hydrotherapy may be good options for dogs with joint disease or limited mobility. To increase activity, cats may be encouraged to chase toys or hunt for treats throughout the house. Olfactory, visual, and auditory enrichment may be particularly beneficial, especially for ill or poorly mobile patients. For example, dogs that cannot walk but enjoy social and sensory outdoor enrichment may be taken in carriers, in strollers, or on car rides. Cats may continue to have outdoor access under supervised conditions (eg, leash walks, secure outdoor enclosures). For increased visual and auditory stimulation, technical or electronic options can be considered. Classical music has been shown to increase resting behavior in kenneled shelter dogs,9 and studies have shown that some dogs and cats show interest in video images, particularly of conspecifics and moving objects.9 Various apps and channels exist to entertain pets, particularly cats, with cartoon mice or other moving images. 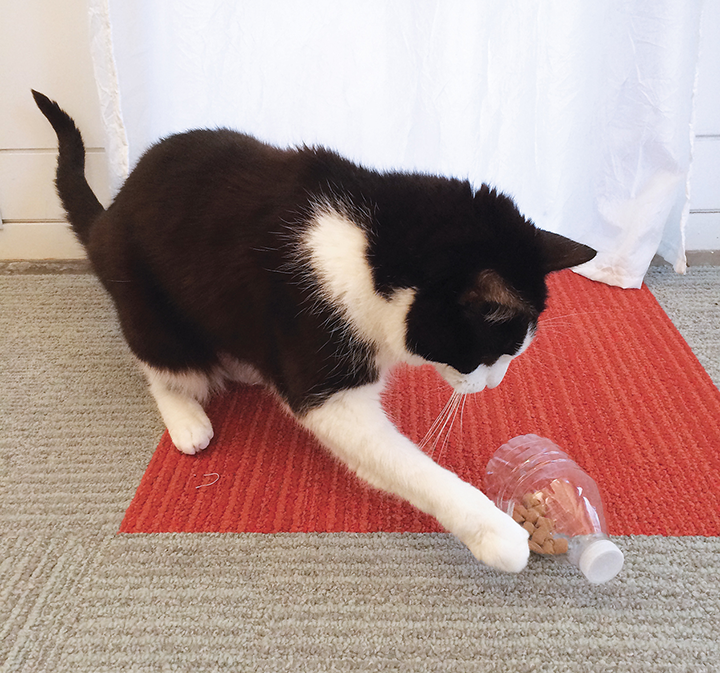 Nonvideo visual enrichment for cats may include positioning a bird feeder outside a window or providing a covered fish tank in the house. Mental enrichment may be provided to cats and dogs at home via puzzle toys and actively teaching new behaviors. Food, treats, or toys may be hidden around the house for the pet to find or concealed in boxes or under towels that the pet must manipulate to find (Figure 3). Many commercial treat-dispensing puzzle toys are available; treats are placed in these toys and pets must determine how to extract them. For patients with physical limitations, owners can teach commands that do not require extensive movement, such as targeting (ie, touching a hand or object with the nose; Figure 4), giving a paw, lying down on their bed, and choosing a treat hidden in an owner’s right or left hand (eg, “right or left”). Social enrichment is an essential part of the enrichment process. Senior pets may not be physically capable of seeking attention and therefore may be overlooked in a busy household. Daily positive attention, whether through playing, training, exercising, or sitting with the pet, should be recommended to all owners of older pets. Neilson JC, Hart BL, Cliff KD, Ruehl WW. Prevalence of behavioral changes associated with age-related cognitive impairment in dogs. J Am Vet Med Assoc. 2001;218(11):1787-1791. Gunn-Moore D, Moffat K, Christie LA, Head E. Cognitive dysfunction and the neurobiology of ageing in cats. J Small Anim Pract. 2007;48(10):546-553. Osella MC, Re G, Odore R, et al. Canine cognitive dysfunction syndrome: prevalence, clinical signs and treatment with a neuorprotective nutraceutical. Appl Anim Behav Sci. 2007;105(4):297-310. Landsberg GM, Nichol J, Araujo JA. Cognitive dysfunction syndrome: a disease of canine and feline brain aging. Vet Clin Small Anim. 2012;42(4):749-768. Salvin HE, McGreevy PD, Sachev PS, Valenzuela MJ. Under diagnosis of canine cognitive dysfunction: a cross-sectional survey of older companion dogs. Vet J. 2010;184(3):277-281. Milgram NW, Head E, Zicker SC, et al. Learning ability in aged beagle dogs is preserved by behavioral enrichment and dietary fortification: a two-year longitudinal study. Neurobiol Aging. 2005;26(1):77-90. Snigdha S, de Rivera C, Milgram NW, Cotman CW. Exercise enhances memory consolidation in the aging brain. Front Aging Neurosci. 2014;6(3):2-14. Pryor PA, Hart BL, Bain MJ, Cliff KD. Causes of urine marking in cats and effects of environmental management on frequency of marking. J Am Vet Med Assoc. 2001;219:1709-1713. Wells DL. Sensory stimulation as environmental enrichment for captive animals: a review. Appl Anim Behav Sci. 2009;118(1-2):1-11. Landsberg G. Therapeutic agents for the treatment of cognitive dysfunction syndrome in senior dogs. Prog Neuropsychopharmacol Biol Psychiatry. 2005;29(3):471-479.